There are two types of packers in the world: minimalists and those who want to take everything. Unfortunately for those who want to take everything, there is pretty limited space on a kayak. In part, this makes the packing process a bit easier but you do need to whittle down a big list into the essentials. A minimalist point of view is good as you’ll never be lugging heavy bags around and weighing your kayak down. That said, you’re at far greater risk of missing something crucially important from your packing list. In this guide, we’re aiming to cover absolutely anything you could ever need on a kayaking day trip. Unofficial disclaimer: don’t blame us if your favorite tin of beans isn’t included. You’ve still got free will, right? Have you heard of the 'Ten Essentials' principle? Essentially, it is a term coined by a mountaineering group and it is considered to be that absolute minimum you should take on a camping/backpacking trip. Although it’s geared towards backpackers, the key ‘systems’ (as they’re referred to) can be applied to any outdoor expedition. As reliable as cell phones are these days, it’s worth taking the traditional map and compass with you, too. You never know when technology may fail you. Additionally, there are plenty of decent waterproof GPS trackers to choose from. This one is fairly self-explanatory. Items which come under this list can include sunscreen, sunscreen for lips, glasses, hat, and clothing. This covers items which will keep you warm. On a kayak, one of the main ways to stay warm is to stay dry, so make sure your waterproofs are well-suited. Other items include paddling gloves, neoprene footwear, dry suit, synthetic balaclava, moisture-wicking underwear, and rainwear. Items to consider include head torch, torch, cell phone torch, batteries. In fact, LED lights tend to use far less battery power, so opt for this if you can. Always do a check of your first-aid kit before you set off. This is especially important if you’re not the only one who uses it. You never know if someone has used up or removed anything in the box. For a kayaking day trip, this might not be as essential but it’s useful to consider if you’ll need to stop to cook lunch or dinner. Fires are also good for warming you up if you catch a chill. Here’s what to take: lighter, fire starter, matches, and waterproof container. This one is super useful for any sort of expedition. Tools under this section can include knives, multi-purpose knives, scissors, tape, and rope. In terms of kayak repair, here’s what to take: sealant, bailing wire, duct tape, putty, and nuts/bolts. Food is what’s going to keep you going for a long and tough day out on the water. Make sure to pack more than you need in case of emergency. Nuts, trail mix, dried fruits, and energy bars will keep you going throughout the day. Similarly, as much as you need food, you need water even more. Staying hydrated will allow you to paddle better and for longer. In an emergency, water will keep you alive. Consider taking a purifier and check in advance to see if there will be any natural sources of water you can use. Nobody expects the worst to happen, but you should certainly plan for it. Would you be prepared if you got stranded for the night? Bring a tarp, a space blanket, a sleeping bag, and large trash bags. If you need to rough it for the night, the key is to stay as warm and dry as possible. What do you need to do so? Bring that. Although the Ten Essentials covers a wide range of important items, it isn’t super kayak focused. 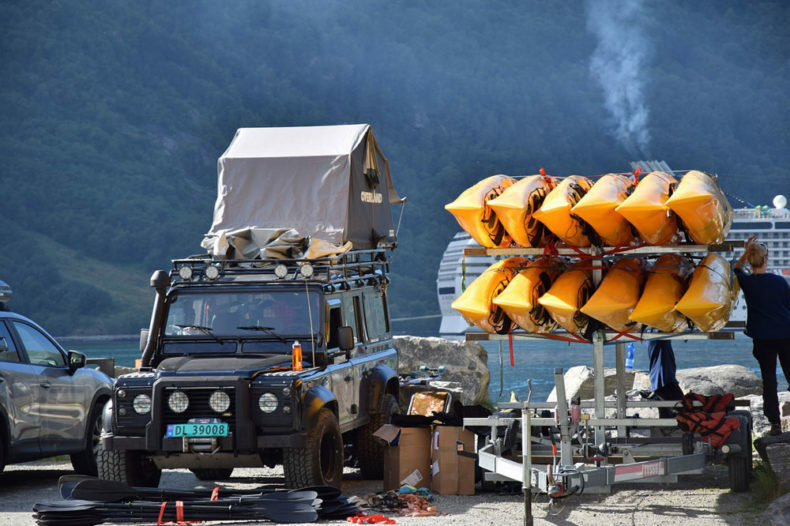 So, we’re going to go a bit more in-depth and take a look at exactly what you’ll when it comes to your kayak. This comes under the ‘insulation’ category of the Ten Essentials, but we believe the potential list is long. Kayaking really requires a specific set of clothing and you won’t get away with what you’d take on a camping or backpacking trip. We briefly mentioned some of them before, but here’s our extended list. For some reason, there are the same few items which are the most easily forgotten. It’s the same every single time. No matter how prepared you are, they’re forgotten. Here they are on a list to minimize the risk of forgetting them!